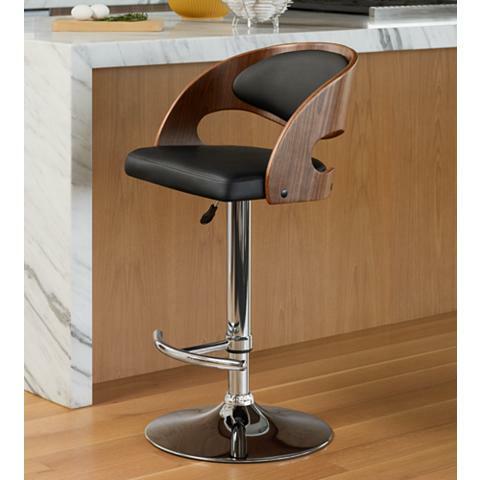 If you love luxe living but with a streamlined aesthetic, you’ll love these bar stools. Leather and wood are the perfect pair for any masculine-vibe interior, especially when they are paired for a luxe living design trend at the bar. Believe it or not, a masculine leather-and-wood barstool can be the perfect addition to a luxe setting. Luxe living isn’t just about furnishings that look like tiaras, the masculine side of luxe is less fussy, but just as fine. It’s all about luxurious leather, metal, and sumptuous textures. So when you read ‘luxe living’ design, you may not be thinking a clean-lined aesthetic. The phrase is probably bombarding your brain with images of refined crystal, velvet, and exotic accents all perfectly and exquisitely detailed. It’s true that the popular luxe living design trend blends elegant design lines with rich opulent finishes, and is described as the ultimate style in glamour and romance. But romance is not always the same for females as males, and there’s the masculine, more straightforward but equally as luxurious luxe for the alpha aesthetic. Let’s take a walk through luxe bar stools, the perfect seating at the much-cherished design feature in any masculine space. There’re so many styles of bar stools out there to be found, what’s your favorite style?